While we wouldn't like to say with absolute certainty that Moon Dog's original Splice of Heaven – the pine-lime version created in collaboration with Beer DeLuxe – was the first local IPA to feature lactose, it was definitely among the earliest. It seemed rather out there at the time – a whole three years ago – but such things are pretty much common or garden these days. 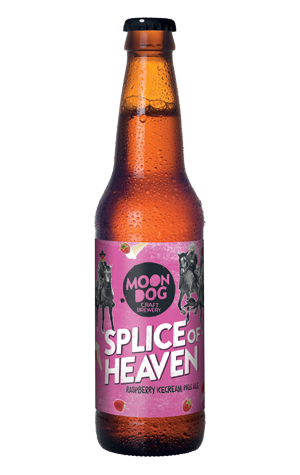 And, as they've brought the Splice of Heaven beers back, the Moon Dog team has headed in the other direction, dropping the lactose and allowing vanilla to do the work of turning the beers into "ice cream pale ales". The new one for summer 2018/19 switches to raspberries in a beer in which the bitterness, and indeed much one traditionally associated with beeriness, have been ostensibly removed from the picture. The first thought upon tucking into the hazy, deep copper drop is raspberry ripple ice cream, but then a biscuity character appears that's reminiscent, within this creamy, fruity company, of a crushed biscuit cake base. Raspberry cheesecake pale ale, perhaps?